How do I use Expo with CodeHS to view my app on my phone? 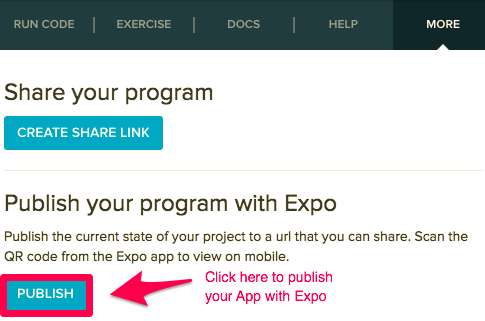 There are a couple ways that you can use Expo to view your program on your phone. They function slightly differently, one is used more for when you are in the middle of development and are testing things, the other is to publish your app so you can open it whenever and other people can view it. In the editor of a React Native or Graphics program in the right section you will see a "More" tab. Under the "More" dropdown, choose the "Run on Phone" option and you will be presented with a QR code to scan. 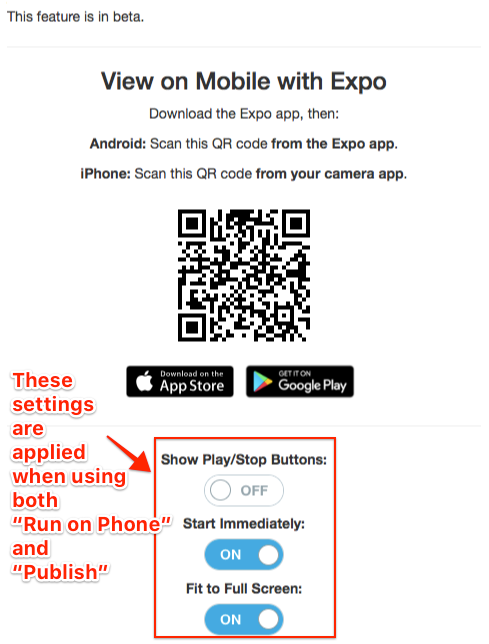 You can now open Expo on your phone and scan the QR code to view the app on your phone. Using the "Run on Phone" option creates a session with expo. Because of this session, any change you make to the program is sent to the phone and your phone will update with the changes that you made. Saving code, running code, or changing one of the options presented in the "Run on Phone" tab will update your phone's screen. This session is temporary so if you navigate away, refresh, or close the page then the QR code you scanned is no longer valid. You will have to visit the "Run on Phone" tab to get a new QR code and scan that QR code to view the app on your phone again. Also in the "More" dropdown you will see a "Share" option. In the "Share" tab you will be able to publish your program to a permanent URL. This will allow you to share you program with others and open the app even when the program is not open on your computer. When you click "publish" it will generate a QR code and url that you can share with others. Any changes you make to your program will not automatically be added to your published program. To see your updates in the published program you will need to visit the "Share" tab again and click "Republish." Note: The settings in the "Run on Phone" tab also apply to the published app, so if you make any changes there that you want others to see, you will have to republish your app again.